Inside: Nature journaling for kids is a core component of the Brave Writer Lifestyle, as well as a Charlotte Mason Education. But what do you do if your kids don’t love it? 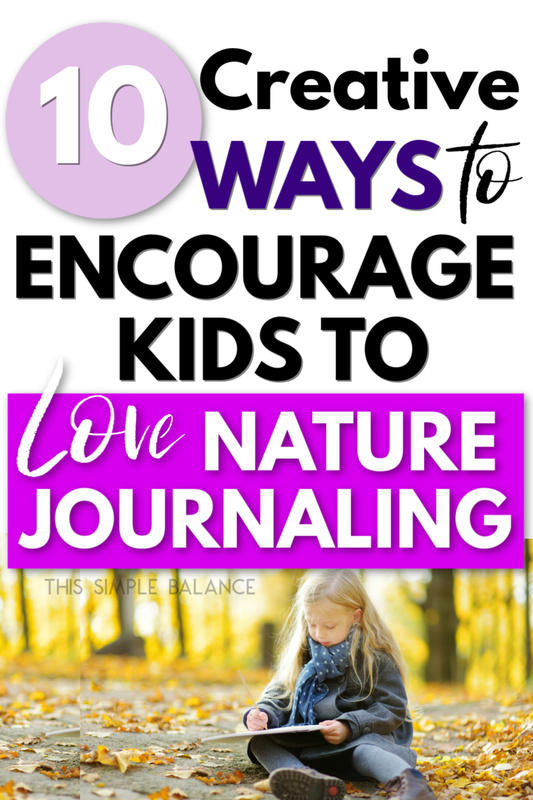 Here are 10 things to try if your kids don’t love to nature journal. My daughter’s homeschool co-op first introduced me to nature journaling. They modeled their in-the-making University Model School closely after a Charlotte Mason education, incorporating living books, copywork, narration, and nature journaling into the curriculum. We purchased a nature journal at the beginning of the year, and my daughter drew a few beautiful drawings. The rest of the journal, however, remained empty. When we transitioned to homeschooling on our own, I forgot about nature journaling. The few times I attempted to reinstate the practice were met with resistance. While my oldest loves all things art, the rest of my kids didn’t quite see the point of the exercise. At the time, I was wrestling through my thoughts on unschooling versus relaxed homeschooling, forced learning versus natural learning, so I let it go. 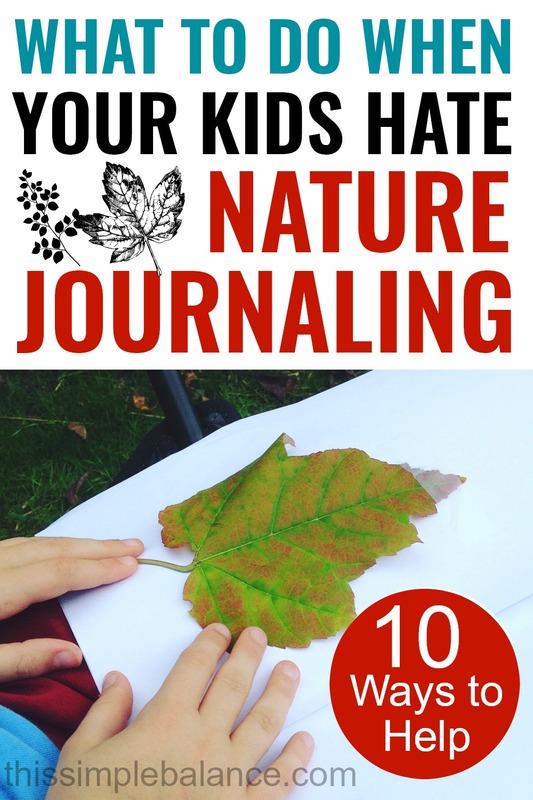 I didn’t want to force my kids to participate, and I was at a loss as to how to encourage nature journaling without pulling teeth. Since that time, I was introduced to the Brave Writer Lifestyle, and nature journaling came up once again. I love everything about Brave Writer, so I decided to give it another shot. 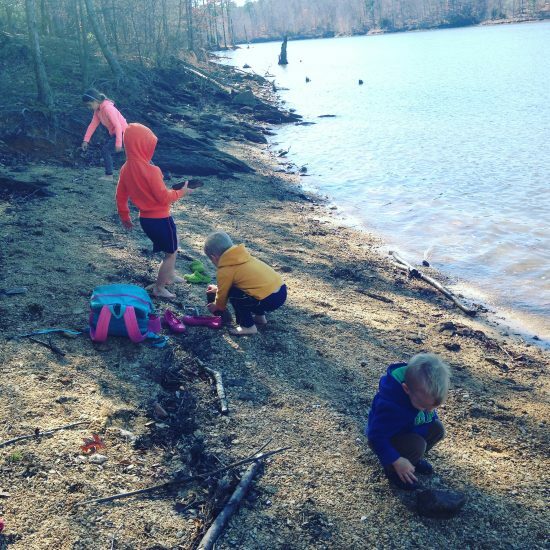 While nature journaling is not a weekly part of our homeschool life, we do love nature walks. Nature walks typically remind us to attempt nature journaling from time to time. 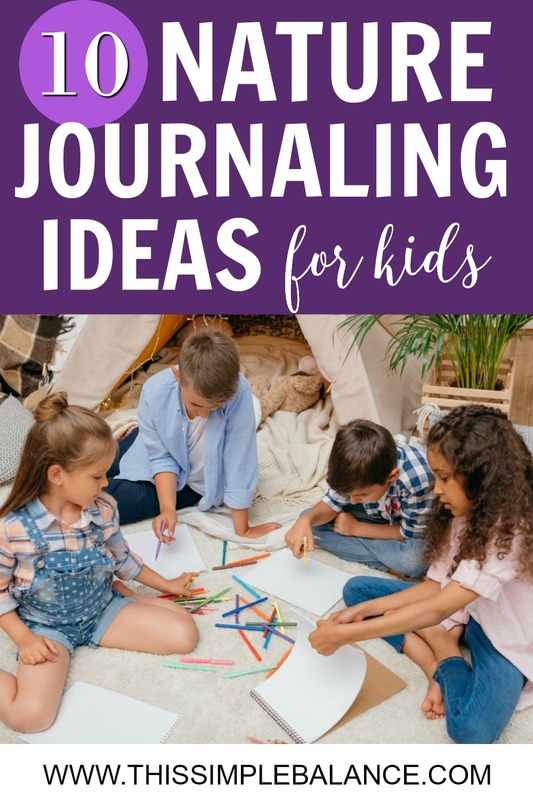 Since our sad, early attempts, I’ve picked up a few tips to make natural journaling more fun for my reluctant little nature journalers. Now, they enjoy the process so much more and even initiate it on their own from time to time! Before I jump into the tips, I’m going to share a few benefits of natural journaling for kids because when I try to include something in my homeschool, I always want to know the “why”. When kids attempt to draw things they see in nature, they develop attention to detail. They also learn to observe objects more closely than you may typically do in a general nature walk. Observing and drawing objects from nature usually generates conversation about the objects themselves, which often develops new vocabulary. Ultimately, my personal “why” for incorporating nature walks and nature journaling into our homeschool is to instill a love of nature in my kids that I hope will produce a life-long desire to spend time in nature. The benefits of spending time in nature for both kids and adults are numerous. If you are interested in reading more about the benefits , I highly recommend the following books. 1) Swap your nature journal for single sheets of paper, instead. I don’t know about you, but I was, and still am, a perfectionist. I’m a less than average artist, but it kills me when my art is not even close to perfect. I find it much easier to get over this if I haven’t “ruined” an entire notebook with a sketch that’s not up to par. I prefer to provide my kids with several sheets of white paper (you can get this for free or pennies quarterly from Staples through their Easy Rebate program). It’s easy for them to start over if they need to, and there is no pressure to have pristine natural journal we will keep forever and ever. As a minimalist, this system also allows me to only keep the best of the best, which takes up a fraction of the shelf space compared to that of several nature journals. 2) Bring clipboards and paper along on nature walks. Having a drawing medium ready and available to your kids on their nature walks may catch them when inspiration strikes. If a large clipboard is too big for a backpack or shoulder back, these adorable mini clipboards would work well for paper halves. Don’t forget the pencils! They can color the drawings at home if they want. 3) Natural journal alongside them. When my kids aren’t excited about something, I step back and ask whether I’m excited about it. If it’s just another assignment to me, it will definitely show. While there are things my kids are passionate about that I’m not, I know that if I want them to be passionate about something, I’d better start being passionate about it. Jump right in with your kids. Especially if they are less than excited about it, don’t just set up the nature journal activity and go do laundry (#thestruggleisreal). Instead, sit down with them for a bit. Try your hand at sketching something yourself. This will both give you sympathy for your kids (drawing is hard!) and inspire them to stick around longer. As a fair warning, if you have a perfectionist child, try not to make your sketch too good, or it may have the opposite effect you’re going for. 4) Try writing about nature, instead of drawing. For kids who are particularly resistant to drawing, try writing about nature instead! One morning, my daughter happened to be up extremely early. She woke up and listened to the sounds of the birds outside. She was so inspired, she decided to write about what she saw and heard. Some kids will be able to express their observations best through words: give them the freedom to write if they prefer. 5) Use nature books and trace the drawings. As I mentioned before, the pressure to try to sketch something from nature in a way that satisfies you is enough for a child to steer clear of nature journaling. You could try tracing things from nature books, instead. Sometimes, you can achieve this with regular printer paper, but often tracing paper is required to see clearly the lines you need to trace. 6) Buy fun, new art supplies just for nature journaling. It may be difficult to enforce using them just for nature journaling, but often, shiny new art supplies can entice a reluctant kiddo. You could try new watercolors, kwikstix, or pastels. I usually don’t splurge on the paper, though. They go through it way too fast! 7) Buy a bird feeder and encourage verbal observations. Since buying a bird feeder, our kids have LOVED observing the different birds that visit our feeder. You can buy a bird book specifically for your state, so they can figure out their names on their own. Make a simple chart to record how many visits you receive from each bird. Especially if they are trying to determine the names of each bird, they will be exercising the same skills you are trying to strengthen through nature journaling: observation and attention to detail. For better or for worse, we get to observe squirrels, too: they are RELENTLESS. 8) Capture insects to study and draw. There’s nothing like some good old-fashioned insect catching to inspire nature journaling! We made a simple bug catcher at our local Home Depot build, but you can easily find a simple bug-catching net and container to store the bugs. You will still likely need to prompt the actual drawing, but my boys tend to be far more motivated by drawing bugs than leaves and flowers. 9) Buy a caterpillar to butterfly kit and draw them at every stage of development. These butterfly kits look like so much fun! We plan on doing this activity in the next several months. You can purchase the enclosure from one company, and they provide a voucher to order the caterpillars from a different company. This would be a fantastic way to bring nature to life in your home and inspire your little artists! 10) Make it a fun event (complete with food), similar to poetry teatime. So why not apply the hallmarks of poetry teatime to nature journaling? 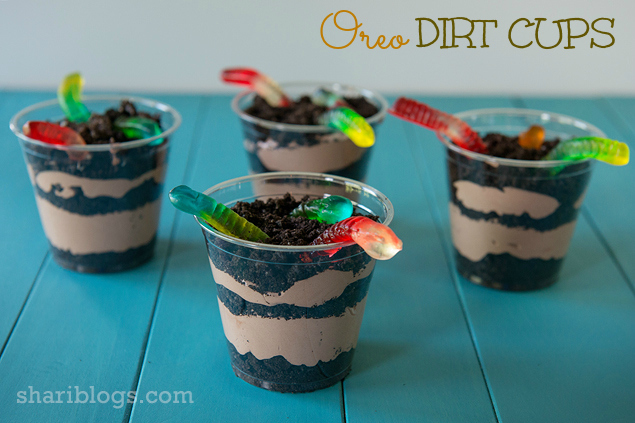 You could prepare fun, nature-themed snacks, like these Dirt Cups with Gummy Worms. (You can buy gummy worms in bulk on Amazon.) There are a plethora of ideas on Pinterest for nature-themed snacks made with healthier things, if you prefer. Keep a pretty/fun tablecloth. Gather a few leaves and flowers from outside to decorate the table – the possibilities are endless. Food always gets my kids excited about things. Maybe it will do the trick for nature journaling? Like any other element of the Brave Writer lifestyle, the way your family does nature journaling can, and arguably should, look different than the Braver Writer family next door. That’s what I love about Brave Writer: Julie is full of wisdom, ideas, and suggestions, but ultimately, she makes no mandates. Remember, at the end of the day, the goal of natural journaling is nature appreciation, to raise kids who love and respect the world around them. 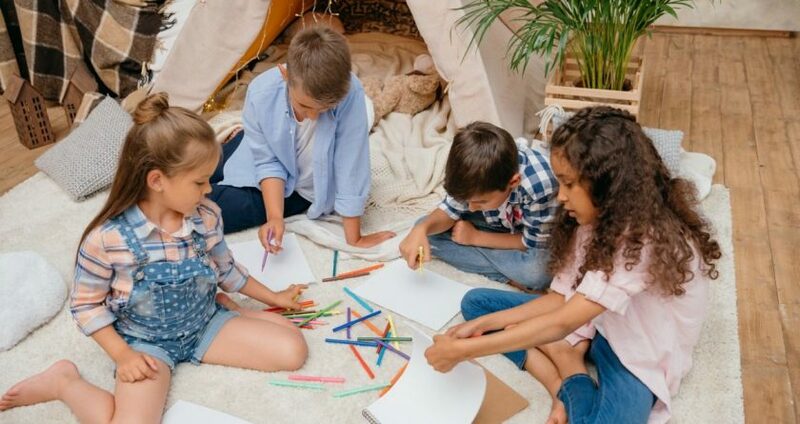 You want your kids to love nature and be motivated to spend time outside long into adulthood because the benefits of spending time in nature are not for kids alone, but for people of all ages. Curious about the Brave Writer Lifestyle? Click here to learn more about how it can give you the tools to give your kids an enchanted education.